Wolves are an interesting subject matter to draw mainly because of all the details in their faces. Whether you know it or not, everybody has artistic ability. Most people assume they cannot draw, so they never try. If drawing is looked at as creating pieces of a whole, instead of looking at the overall picture, drawing becomes much easier. Begin with the eyes. Whether the eyes are captured correctly is a big part of how the overall picture will be finished. Wolves have big almond-shaped eye sockets, however, the eye itself is recessed near the outside of the socket. Make a half circular arc starting at the inside point of the right eye socket and extending down, away from the eye. This will represent the cheekbone, which is very important to establish the wolf's facial structure. Extend a line down about a half-inch starting at the bottom point of the cheekbone arc from step 2. This will be the right side of the wolf's snout. Draw a parallel line about a half-inch to the left of the line created in step 3. This will be the left border of the wolf's snout. Connect the bottoms of the two borders with a horizontal small arc. Draw the wolf's nose by creating a not quite symmetrical circle directly underneath the arc in step 4. Two sideways teardrop-shaped nasal passages need to be created, one at each side of the nose. Draw a very tiny vertical line going down from the bottom of the center of the nose. This line will connect the nose with the mouth. Picture the wolf's mouth as W-shaped, however the middle prong of the W is the vertical line you created in step 6. Draw the rest of the mouth by creating the other two humps of the W shape, making the points slightly flattened. 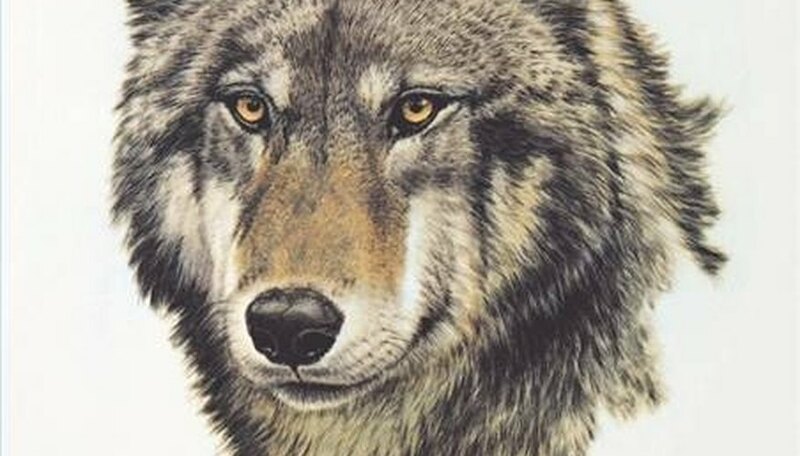 Draw the wolf's ears by moving your eyes an inch above the inside points of the wolf's eye sockets. This will be the inside point of each ear. Create an upside down U-shape to create the ears. Connect the two ears by creating a horizontal arc, much like the one you made in step 4. This will be the very top of the wolf's head. Shade the borders of the wolf's head by using your shading stick or the flat side of the pencil. The coloring is important, so make a special note of the places the wolf is darkened. Shade around the mouth and the eyebrows, specifically leaving these spaces white. Shade the snout and the tips of the ear the darkest spots on the wolf. Everything else should be variations of light and dark. Each wolf's coloring is different, so there is no exact right way to do it.